The persimmon or kaki fruit is often called due to their similarity as sweet tomato, but actually is the generic name for Diospyros Divine Fruit. In cultivated Asia, for centuries it belongs to the everyday life there. In Europe, it is gaining notoriety. 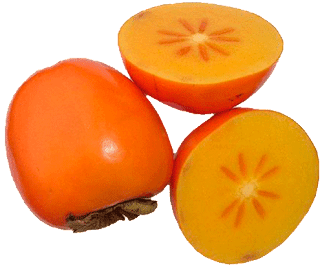 Nevertheless, many people have never tasted a persimmon, which is why we'll tell you here 4 things you should know about the Kaki. Externally similar to the Kaki large yellow-orange flesh tomato, which is why they are often referred to as sweet tomatoes. In addition to up to 19 percent glucose, a persimmon fruit has also boast a very high mineral and vitamin content. In addition to limestone, calcium, magnesium and phosphorus, also a very high proportion of Pro Vitamin A is present. With a persimmon fruit can therefore half the daily requirement of vitamin A are covered. Despite the pronounced sweetish taste the fruits are relatively low in calories, making it a consumption especially attractive, roughly comparable with apricot or peach-like taste. 100 g have about 71 calories, so it brings a whole kaki fruit on about 107 calories. Compared with other winter fruits are persimmons but little calorie. Kiwis have, for example, 50 calories per 100 g, oranges and tangerines 47 calories 50 calories. The persimmon is one of the oldest cultivated plants. In China, the persimmon fruit is cultivated and eaten for over 2000 years. Especially in China, Korea and Japan, the fruit is widespread. It is said that around 90% of persimmon fruits come from these countries. The persimmon has prevailed not only because of good taste, it is also very healthy. It contains a lot of biologically active substances, such as iron, fiber, vitamin C and carotenoids. The free radicals, which harm the human body cells are neutralized by these substances and thus combats. The Kaki thus protecting for example against cancer and atherosclerosis. Due to the high proportion of Pro Vitamin A benefit especially the eyes, the skin and our mucous cells of the persimmon fruit. Normally, the persimmon fruit is consumed shelled and in its raw state. However, the fruit is a bit strange for many at first, which is not at the taste, but rather on the gelatinous consistency. Therefore, the persimmon is also often processed in a fruit salad or enjoyed together with Quark. Before consumption it is important to remove the leaves. Are the fruits particularly ripe, the shell can be eaten, but the taste is not for everyone. Otherwise, the shell is removed easily as an apple. Then you cut the fruit in columns, or you spooning like a Kiwi from easy. In every nation and culture, however, the fruit is consumed differently. In Japan, for example, the Kaki is parched. Especially often they take the Japanese New Year's Day to be because the persimmon has the reputation of having a positive effect for a hangover. However, the persimmon fruit should not be consumed in large quantities, as it could otherwise cause diarrhea. If you buy a persimmon fruit should be taken to ensure that they, nor is too hard to soft. Hard persimmons can not be eaten immediately, while soft persimmons very quickly have bruises. Much like Kiwis, the fruit is very soft quickly. Due to the many tannin they also taste very bitter and lead on your tongue a furry lining, so it can be hard persimmons ripen a few days at best. In this refrigerator still solid persimmons can be kept easily two to three weeks. Very soft and thus already ripe fruit should however be consumed quickly, otherwise they will be too mushy.